I used a sand dollar stamp from Blockheads Paper Arts (they're not open anymore), gorgeous shell sticker from K & Co., sentiment from Papertrey Ink, and other goodies that make me think of the ocean. The Mottle Brown seam binding from Hug Snug is such a dream. It's the perfect brown for many of my cards, because it has a gray-ish cast to it. Love, love, love. I buy mine at The Zipper Stop. You get 100 yards for $9.50. What. A. Bargain. I used a Colleen bow here (what else is new??). See you tomorrow, and thanks so much for coming by! A gorgeous card indeed, Colleen!!! So gorgeous! I loveeeeeeeee the shell and the mesh material!!!! Fabulous! 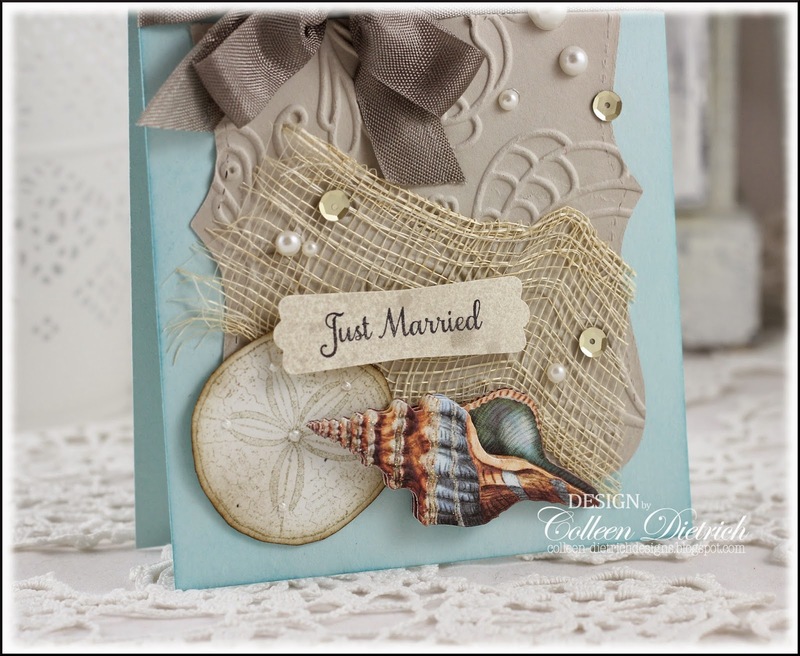 Your card is just perfect for a beach-theme wedding! Just because of you, by the way, I went to the Zipper Stop to look at the seam binding ribbon. I was overwhelmed and couldn't decide, so did nothing. What a selection at such a great price! I do love this color you used. Great card, Colleen! 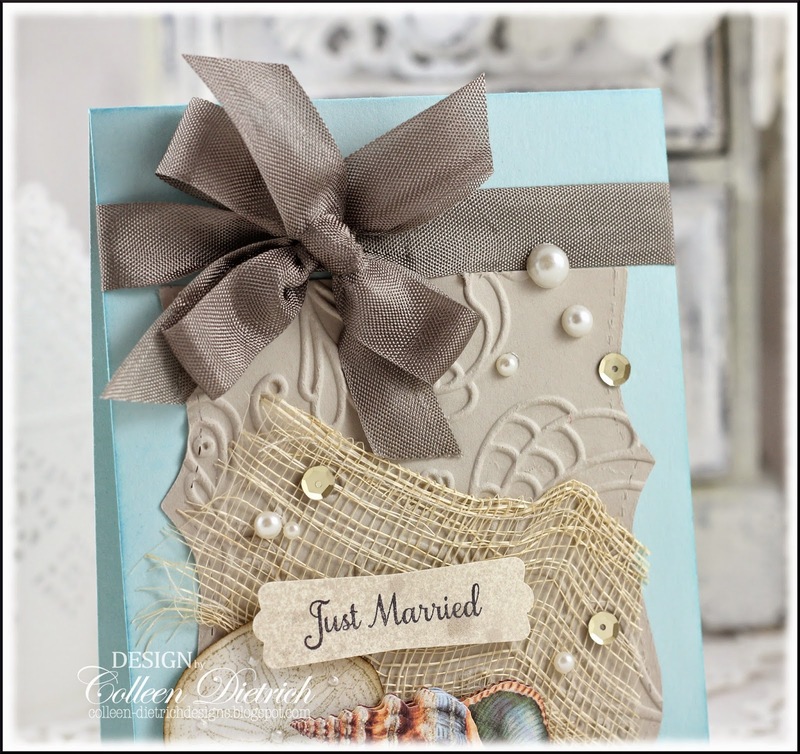 Loads of beachy prettiness and terrific textures! Fabulous Colleen!! Gorgeous card! Love the beach theme. Gorgeous! Anything sea/ocean/beach inspired is right up this girls lane! I love this to bits! 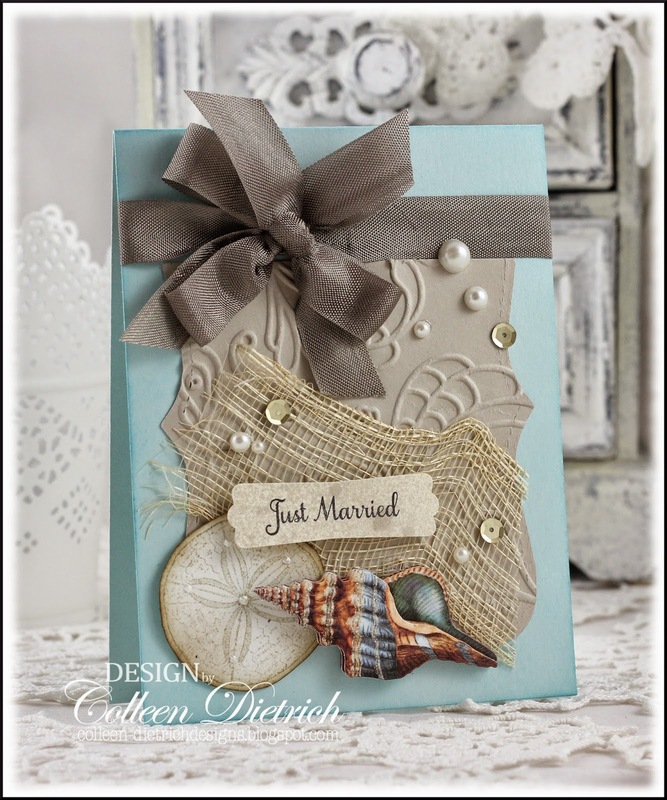 Perfect card for a beach wedding!! Love the colour combo too! Gorgeous card Colleen!!! So elegant and stunningly designed!